ABOUT THE CREATORS OF THIS CD ~ Jon and Rika are two huge and generous souls whose commitment to the traditional music of British Columbia is inspiring and important. They are among the very few keepers of a tradition that struggles to stay alive against a tide of canned and produced narrative. I first met Jon and Rika a number of years ago in a living room on Bowen Island where I live. A small group of folk musicians on our island had started up a monthly kitchen junket, a traveling party full of songs and tunes and neighbours coming together. With a nose for such garrulous fun, it seemed natural that they should show up there to sing. A regular selection of sea shanties and Irish songs and English fox hunting ballads were sung that night along with some bluegrass and vaudeville. But I was stopped in my tracks when Jon sang a cowboy song from Lillooet. A folk song from BC? A traditional song about THIS place? Of course I later learned that preserving and sharing folk traditions is no mere curiosity for these two but rather a passionate life’s calling. Jon and Rika are among our foremost curators of British Columbia’s story, and they hold that responsibility with a deep love for its continuation, and a vested interest in it being a story of fairness and equity and promise. In carrying forward the songs of our home places, Jon and Rika inspire us to learn to sing and make the songs of our communities, work and struggle. They challenge us to know who we are and where we come from. They are not merely performers and artists, but they are community builders and advocates for a participatory culture, inviting us to join in its making, and to illuminate what we find in doing so. It has been my great privilege to join that call, and I hope this CD will inspire you likewise. RECYCLED TUNES ~ Almost all the songs on this CD are ‘to the tune of’ another song. BC was settled by people from many lands, who did not share a musical culture. Song makers thus had to use melodies that everyone shared. The majority of songs recorded here are from the first third of the 20th century. The popular songs of that time were often sentimental love ditties or nostalgic songs about home and that is the material out of which BC’s early song makers made their songs. The tunes to which these songs were meant to be sung were rarely indicated in the newspapers where we found them. The assumption must have been that readers were familiar enough with the original songs to recognize them in the parodies. “The Hangup Stick”, for example, begins with the phrase, “How dear to my heart my remembrance of milling,” the first eight words of which are identical to those of “The Old Oaken Bucket”. The shared familiarity with current popular music would thus have allowed readers to sing these songs without the use of sheet music. PRINCETON ~ Though the site of the town was platted in 1860, shortly after founder John Fall Allison established a ranch, it was not for another forty years that a town came into being. Princeton owes its existence to mining. The successful mining of gold at Granite Creek in 1885, coal in Princeton in 1898 and Tulameen in 1901, and copper at Copper Mountain in 1920, guaranteed the economic base for the town, and by 1918 its population tripled from the 316 people here in 1901. The surrounding areas had functioned as ranches since John Fall Allison’s time, and they function so today. The town also has a lumber mill, the town’s largest employment site. These days, there are a significant number of retirees, which helps to dampen the wide swings of boom and bust typical of towns with logging or mining bases. Tourism is also a significant economic factor. Hard rock mining is mining for metals such as copper, zinc, gold, silver or platinum. Unlike coal, which is soft and appears in distinct seams, metals are found in ore. The process of mining these metals entails a three-part sequence: a) breaking the rock (drilling and blasting), b) loading (mucking) and c) transporting (hauling and hoisting). In preparation for blasting, holes are drilled in the ore face with machines such as the water Leyner, a mounted hammer drill used with water to reduce dust. When the blasting is finished, it leaves a pile of broken rock called muck. The mucker’s job is to load the muck with a pick and shovel into a wheelbarrow or ore cart for transport to the surface. Hard rock miners were highly itinerant, working in one mine until they’d had enough or until they were laid off because the mine was downsizing or closing. They had a reputation for working hard and playing hard. After a period in a remote mine populated entirely by men and with little recreation, they would head for town. They shared with loggers, sailors and Australian sheep-shearers a life of toil and isolation punctuated with periods of high spending and overindulgence, which left them broke or in debt with no option but to return to the labour that drove them to the bright lights. The conceit of this song is that of two miners who had worked together as muckers in Butte Montana meeting in Kimberley, BC, “where Mark Creek flows”. One of them brags that he has been promoted from mucking to running the water Leyner. He goes on to recount the many mines he has worked in since they last met – Flin-Flon, Manitoba, the Yukon, Coeur d’Alene, Idaho and Cobalt and South Lorrain in Ontario. Providing light in pitch-black underground mines has always been a challenge. Early miners used lanterns or candlesticks. In a coalmine these were dangerous because of gas. If the candle were held too low the heavier gases that accumulated near the floor would extinguish it; if it were held too high it would ignite the explosive gases near the ceiling. The miner in this poem appears to be working in a gold mine (“the glints of gold”) where there was little danger of an explosion. Anyone who has experienced total darkness can imagine the comfort a small pool of light would bring to a miner who was working underground in a maze of tunnels and shafts. This song appeared in the Similkameen Star in 1900 with no author mentioned and no accompanying explanation. Milling is when the ore from a mine is fed through ore-feeders into a stamp mill and then stamped into particles small enough to be processed. The stamps were large pestles with removable cast-iron shoes that crushed the ore. When a shoe broke, the hang-up stick was used to immobilize the stamp so that the shoe could be replaced. It is “grease- festooned” because of the oil that dripped down from the camshaft that was still moving above the stamp. The first stamp mill in the Princeton area was in Hedley and was built in 1902, after this song was published. This suggests that the song was made by someone who had worked in a stamp mill elsewhere, possibly Idaho or Montana. The publication of the song would seem to presuppose a readership that could make sense of it. Our thanks to Harry Bell for his enlightening conversation about stamp mills. Deciding where to mine for ore is determined by drilling cylindrical cores of rock just under two inches in diameter from various locations. These core samples are then trucked to an ore shack where they are broken into approximately four-inch lengths and then split in half. One half goes to the assay office for evaluation and the other half stays in the shed. When they have been assayed, samples that show promise are matched with their other half to verify the location of drilling. John Henry, who made this song, worked in such a shack at the Nickel Plate Mine in Hedley during the 1980’s. He describes splitting the core samples with a machine that sent shards of rock flying through the shack. He and his partner improved on the splitting machine by devising a handle (“With a pull on your arm and a twist of your back”) that made the job easier. Paddy Graber, who worked at Copper Mountain in the early 1950’s, collated this song from his own and other workers’ recollections. Copper Mountain, southwest of Princeton, was at that time an underground mine, owned by Granby Mining Company. The song is full of mining jargon, and describes a miner’s tasks in drilling. First, a stoper, a drill, is dragged to the mining face and set up on the dock, a platform for drilling, held in place with bullpricks, used steels or drills. Hoses for compressed air, which ran the drill and water, to hold down the dust, are hooked in. Drills come in three-, five- and eight-feet lengths, and the miner begins to drill with a three-foot starter. Breaking to the nuts describes a successful blast, when an eight-foot depth of the face breaks away. A miner is left with a bootleg when it doesn’t entirely break. The miner in the song decides to pull the pin (quit) and finds that after all the deductions he has nothing left. Of the other mines mentioned, Sheep Creek is in the Kootenays, Mascot at Hedley, Pioneer and Bralorne in the Bridge River country, and Aisla and Gold Quartz, in the Wells/Barkerville area. When we sang the song for Harry Day and Evelyn McCallum, they chuckled as they recognized the names of Bob Douglas, the mine superintendent, Jack Ross and Don Pringle, mining engineers, Ed Foy, a mine foreman, and Henry Klapproth, a shiftboss. A haywire outfit is a logging operation that is badly run with faulty equipment (as though repaired with haywire). The man who made this song worked in the woods around Princeton in the 1950’s and was so disgusted at the perilous working conditions that he was moved to describe them in song. First a truck-load of logs collapses, then the teamster’s horses (used for yarding logs) get spooked, then the cat-man driving the HD (an old tractor) can barely see through his sweat as he winches the logs to where they can be loaded onto a decrepit White truck. When a log boom arrives at a riverside sawmill it is broken up in the pond, a protected body of water in front of the mill. The pondmen steer the floating logs onto the jackladder, a conveyor belt that pulls them into the mill. The first saw encountered is the head rig (replaced in 1962 by the head chipper), which squares the round logs. The carriage then moves the squared timber to the various saws (bandsaw, trimsaw, planer). The last phase in the process is the handling of the lumber as it streams off the production line. The ‘green’ – that is, undried and therefore heavy – lumber moves along the greenchain to be separated by grade and sized into piles ready for removal. Workers on the greenchain must remove lumber as fast as it appears, no matter how large or awkward, and move it to its appropriate pile. Theirs is the lowest paid, least respected and most backbreaking job in the mill. The song was made by a long-time logger, and we thank Lyn McGown for the use of her tune for this song. From its first issue in June of 1900 the Similkameen Star featured regular front-page columns about the need for a railway. 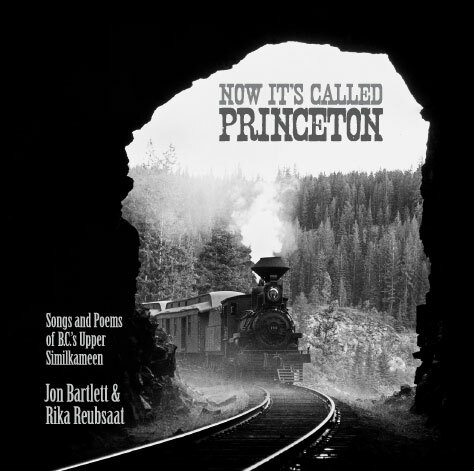 Princeton’s “crying need” was a railway to transport tons of ore (“hidden riches”) to a smelter. Appeals to James Dunsmuir, the Conservative premier of BC from 1900 to 1902, fell on deaf ears and the Canadian Pacific Railway was not prepared to construct a railway in southern BC until driven to by the construction of the American JJ Hill’s Vancouver Victoria & Eastern Railway, which came north to Oroville, then west to Keremeos, Hedley and Princeton. The thought of all the province’s riches being siphoned southward was the impetus for the construction of the Kettle Valley Railway. A fond dream of easy access to the coast. The ‘cars’ are of course railway cars, and the tune (“Wait Till the Sun Shines, Nellie”) was at the time a three-year-old pop song. Jon writes, “My father held a series of very senior positions in British Rail, yet he nevertheless described himself on his passport as ‘Railway Servant’, which bemused many passport control officers. The ‘ownership’ Larry Sullivan felt for his section would not surprise any old railwayman: to run a railway is a public service, a 24/7 commitment, not a 9 to 5 ‘job’. I remember when I myself worked for British Rail in the ‘sixties interviewing railway workers who would say, for example, ‘I looked out the window and it was foggy, so I thought I’d go down and give Tim a hand in the signal-box’ – unpaid, unrecognized, unthanked dedication to ‘duty’ that these days would perhaps surprise young workers, but in those days was taken for granted.” A section gang was responsible for the maintenance of the ‘permanent way’ (‘p-way’, the track itself – rail, cross-ties [Br. ‘sleepers’] and the road-bed itself [Br. ‘ballast’]). Larry Sullivan was in charge of such a crew. Their job was to ensure that the rail was firmly located and was level with the rest of the track, and to do this they would jack up the rail at low points and fill with ballast. The ‘car’ which constantly needs to be ‘’iled’ is a hand-car, pumped (‘uppy-downy’, like sea-pumps) to make it move, and used by the crew to move up and down the ‘section’. Ean Hay made the song from the experiences of his father who rode the rods or rode in boxcars at the end of the First World War. From the 1880’s to the 1930’s, it was common practice for workers to travel throughout North America in this way, looking for work. Railway bulls (railway police) often kicked men off the trains and threw them into the local stir (jail). In the early 1900’s, women’s groups in Canada were involved in a variety of causes, from organizing local social and educational activities to promoting better health care and raising money for the war effort. One such group was the Women’s Christian Temperance Union, a strong advocate for prohibition as well as for women’s suffrage. Its members believed that if women were enfranchised they would vote overwhelmingly for prohibition. They were influenced by the social gospel movement, which held that creating the right social conditions would bring an end to alcoholism, crime and other social problems. In September 1916 British Columbia held two referenda: the ‘Women’s Suffrage Referendum’ and the ‘Prohibition Referendum’ – both issues were deemed too controversial to be decided by the Legislature alone. The results were the Provincial Election Act Amendment of 1917, which extended the provincial franchise to women, and the British Columbia Prohibition Act. In retrospect, the 54% yes vote to Prohibition was clearly not enough to effect a change in people’s social habits. It did not, of course, bring an end to alcoholism, and the October 1920 referendum ended Prohibition by authorizing the sale of sealed bottles from Government Liquor Stores, the first of which opened June 1921. A further referendum in January 1927 authorized the sale, where a local plebiscite approved, of ‘beer by the glass’, and the infamous beer parlors were born, where no dancing, singing or games were permitted and women were permitted only when escorted by a man. That the profits from government sales of alcohol were partly to be directed to Mothers’ Pensions, hospitals, and the like was probably a sop, and an effective one, to those still opposed to easily available alcohol – much as today gambling is socially validated by its profits going to artistic endeavors). It seemed however to the author of this little ditty that miners were merely financing their own pensions with the money they spend on booze. In 1902 when this poem appeared in the paper, Princeton had a population of just over 300. The English settler who made this song came from a land that had been occupied for centuries. Imagine his shock at the raw landscape (“surrounded by a pile of logs”) he found in Princeton. Anyone who has seen a freshly logged clearcut can visualize the raggedness of early Princeton hewn out of the Similkameen wilderness. This poem is in the same nostalgic vein as “A Scarborough Settler’s Lament”, a nineteenth century Ontario lament for Scotland. This song appears in BC in the late 1920’s. It’s a localized version of “The Lakes of Pontchartrain”, itself a probable reworking of “The Little Mohea”. The ‘crocodiles’ of Louisiana become the ‘coyotes’ of BC, and the ‘ties and railway crossings’ would refer to the Vancouver, Victoria and Eastern, an American railway, a section of which ran along the Similkameen River between Oroville, Washington and Princeton, where it met the Kettle Valley Line. The narrator of this song would thus have walked approximately 60 kilometers, southeast from Keremeos, through Cawston, and thence across the border to Oroville. Phil Thomas collected this song in Princeton from Bob Baird in 1963, and it is still widely known. The song seems to be a sort of anthem about the joys of life along the Tulameen, although many in this area would dispute the pleasures of having “deer come to the door”. Mule deer are pests here and planting a successful garden without an eight-foot fence is impossible. This song resembles the “come all ye’s” found frequently in the lumbering woods of eastern Canada in which the singer mentions many fellow workers and complains jocularly about the conditions. The maker of this song seems to have been working at an old placer mine on the Tulameen River, a “hydraulic” where water under pressure was used to make a slurry. To work off your dead horse means working to pay off your debts. The phrase has a nautical origin and refers to the first month’s wages paid in advance, ostensibly to buy clothing and gear for the voyage but more often than not spent on pleasures. This meant that for the first month on board the sailors were working for nothing or rather working to pay off their dead horse, their month’s advance. Blakeburn was a coalmining town northwest of Princeton and is the site of the disaster known locally as “Black Wednesday”. On August 13th, 1930, an explosion in the mine killed forty-five men, making it one of the worst mining disasters in BC. A mere four and one half months later this song appeared in the Similkameen Star, a testament, surely, to the vitality and humour of the populace. The ’thirties saw many unemployed and Princeton was no exception. Single men sometimes had a harder time of it, because they were often resented for competing for jobs with married men who had families to support. “A Plea for Single Men” is part of a much longer letter written with Swiftian wit by “Martha Muggins” to the Similkameen Star in January 1931. “A Midwinter Night’s Dream” was a poetic response published two months later. BC abounded in ‘instant’ towns that sprang up around mines. Speculation and investment in a new mine went hand in hand with land speculation, and profitable land speculation depended on an indication of permanence. Newspapers were one such indicator. The smallest mining boomtown, tucked away in a remote mountain valley, might boast two newspapers. Newspaper editors were significant people here because they were the voice of the town and were often one of the few educated people. In boom-and-bust BC they tended to move frequently, setting up a newspaper in one location and, upon the death of the town with the depletion of the ore or a drop in mineral prices, moving elsewhere to begin again. A tramp is a typesetter who, because of his skill, could travel in search of the perfect job. Many tramps were addicted to drink as well as to travel and often held a cavalier attitude toward responsibility. The devil is the “gofer” or office boy, and has the job with the lowest status and lowest pay. The comp (short for compositor) is the one who sets up the type to print from. The make-up man lays out the printed galleys. Anyone who has ever tried to dry their hands on the roller towel in a garage mechanic’s washroom will have a small inkling of the condition of the printer’s towel described in this song. In 1919 when this poem appeared in the paper, Princeton must have seemed a very small “burg” indeed to a town- or city-bred settler from Britain or the east. It is easy to imagine his feelings of loneliness and isolation upon first arriving. His sense of being embraced by friendship echoes our own experience. A parody by Coalmont resident Bill Frew of Percy French’s famous “The Mountains of Mourne”. French’s song was a mild satire on the gullible Irishman in London, gulled into joining a street labour gang with the notion that the gold-flecked quartz of a London sidewalk was in fact where gold came from. Frew’s new words suggest that Coalmont itself (as so much of the southern interior of BC) shared in this naivety, though here caused by boosterism rather than innocence. This song speaks of an enormous rockslide some nine miles east of Hope, BC which killed four people. The scar on the mountainside is visible to this day. Two earthquakes occurred in the early morning of 9 January 1965. The first brought down a relatively small rockslide, but the second transformed the valley. On the face of Johnson’s Peak, 100 million tons of rock began to shift and slip. It slid down 2,000 feet at speeds of up to 100 miles per hour, gouging 500 feet into the mountainside. It slashed across the highway, obliterating the vehicles held up at the first slide, pulverizing Highways Department heavy equipment, scooped up thousands of tons of water in Beaver Lake and snapped off huge trees 200 feet up the other side of the valley. It buried the valley to a depth of fifteen feet, and closed the highway for 21 days. This song, set to the tune of “Tramps and Hawkers”, was made by Paddy Graber from newspaper reports shortly after the slide. John Henry worked at various jobs at the Nickel Plate Mine above Hedley from 1982 until 1996. This song describes his route to work from Princeton, 40 kilometers west of Hedley. He often had to leave home in the dark to get there on time. The road winds up ten precipitous kilometers to the mine at 5500 feet. It was only one lane wide so before heading up John had to look up the mountainside for dust clouds to warn him of oncoming traffic. This song is a gentle ribbing of a type often seen (and much resented) in the west – the younger son of an aristocratic family, sent “orf” to the Colonies to keep him out of trouble, since the only type of activity traditionally acceptable to the aristocracy was governing (a seat in Parliament), shooting (as an officer in a good regiment), or praying (in the aristocracy of the Established Church). Trade or industry, in any form, was beyond the pale. Phil Thomas found a parallel poem (SPNW, 2nd ed., 192), structured on the lines of Kipling’s “Young British Soldier”, which advises the broken-down rancher to “go off to the Klondike with the cash that remains”, and thus dateable to the same era as this poem. When songmaker Zeke Hoskin came to Princeton in the summer of 2007, he spoke for several hours about the town’s history with Nick Mills, curator of the Princeton Museum. The result of that conversation was this song. The original name of the site that became the town of Princeton was Vermilion Forks, so named for the brightly coloured ochre sandstone that the Similkameen First Nations traded with other tribes as far east as the prairies.